Richardson Media - Television's new golden age? There are some broadcasting types who are convinced that nothing is ever as good as it used to be. To them the past was brilliant and the present and future are crap. They are the sort of people who would still like their cars to leak around the windscreen, have punctures every few weeks and require a full service every thousand miles. They are what might be termed people from a Golden Age. I don't much believe in Golden Ages - certainly not when it comes to the old days of television news. Ollie Wilson [in a recent issue of Press Gazette] seems to be a Golden Age Man, fretting that the BBC's star correspondents are indulging in punditage - a blend of punditry and reportage -- confusing and misleading viewers. He longs for the days when television reporters stuck strictly to the facts and kept all but the blandest, carefully balanced, carefully sourced observations to themselves. Not me. In my view, BBC television news has never been better, and I speak as both a viewer and a former practitioner. I first worked in BBC television news back in 1980 when a mouthy Kate Adie was beginning to carve out a name as a reporter and Angela Rippon was still the talk of Britain for revealing her elegant legs and dancing skills on Morecombe and Wise. 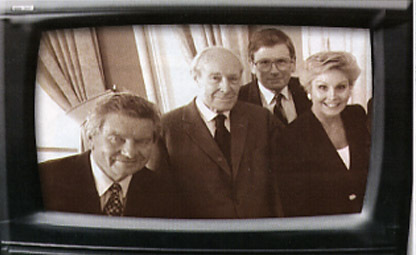 The news bulletins were a national event, presided over by Angela - then one of the few journalists on the news presenting team - plus Richard Baker, Kenneth Kendall, Robert Dougall, Peter Woods and Jan Leeming. They were great times and we were proud of what we produced. But we were constantly reminded that television was almost always less immediate than radio, and frequently lagging behind the daily newspapers. Most foreign picture stories were at least a day old, and even a major news event within London could take hours to get on air. Satellite links were very expensive and had to be used sparingly. The graphics were handmade, using scissors and paste, and were consequently dull and static. Our scripts were competent, but unexciting. There were no interviews and no explanations because both of these were judged to be the province of Current Affairs, which lived in intellectual isolation down the road at Lime Grove. About 10 years later, I was back at Television Centre and much had changed. Video tape had completely replaced film, satellite links were routine, computers were generating many of the graphics, and television was no longer the slowest to report a story. It was fun and it was exciting. But still, it lacked something. That "something" was the rounded telling of a story. We dispensed the facts and only the facts - always giving even-handed coverage to both sides of an argument - and often leaving the viewer none the wiser. It was soft-option journalism. But we congratulated ourselves that we had fulfilled our journalistic duties as public broadcasters. Take Northern Ireland, as an example. Week after week, month after month, year after tedious year, the facts were gravely trotted out. But what did they ultimately tell the viewer, numbed into a state of crippling apathy? Answer: almost nothing that really mattered. And Heaven forbid the correspondent tempted to say "forget 'the facts' for a moment and let me tell you what I think is really going on". Ollie Wilson seems to be saying that this sorry state of affairs is to be applauded. "Let the viewers make up their own minds," he asserts. But how can they if they are given "facts", but no context? Of course, I need the "facts", but what use are they if I never learn what is happening away from the gaze of Joe Public? Two opposing points of view, given equal prominence, is not just inadequate journalism, but it may even be misleading if, say, one of those views is held by someone of no consequence. By all means give minority points of view, but let's also be told whether this view is ever likely to change a thing. No longer with the BBC, I now sit at home as an ordinary viewer and watch with admiration and envy the Ten O'Clock News with its clever and informative graphics, its instant access to the world via satellite links and videophones, and its array of star correspondents doing their darndest to give me the answers to that most basic of questions: what is going on? The rise of the star correspondent has been a gradual process. After all, John Simpson, with his distinctive brand of Boy's Own Adventure Journalism, was there long before Andrew Marr, but it is Marr who so dramatically led the way with a new style of reporting. Overnight, the BBC political coverage was transformed. Suddenly, here was a man enthused by his specialism and bursting to explain British politics with clarity and humour. Here was a reporter not frightened to tell us what, in his best judgment, the story was all about. Hurrah! Economics coverage has also been brought alive by Evan Davis, the new Economics Editor, replacing the overpaid, pompous, impenetrable and thankfully rarely seen, Peter Jay. At the same time, Business Editor Jeff Randall, is beginning to get to grips with explaining the business world after a decidedly iffy start. Abroad, there is a whole array of thrusting, intelligent and thoughtful young correspondents. Ollie Wilson attacks the Washington correspondent, Stephen Sackur, for resorting to describing the body language of US Defence Secretary Donald Rumsfeld, in a story about Camp X-Ray. Why not? A politician's body language is often more truthful and informative than the words they utter. Wilson further complains about the failure to always source the information. But does it necessarily matter, if the correspondent is accurately telling the story? Better that than resorting to the blatant fakery of "sources close to the Chairman" (often the Chairman himself) and "as one taxi driver/soldier/backbench MP put it" (a quote made up on the way to the office). And pray tell, what is wrong with Andrew Marr observing that politics is better than the alternative [war] or Social Affairs Editor Niall Dickson warning that "we ignore these bugs at our peril"? There are, of course, attendant dangers with the star system. Stars have egos - often very big ones - and this can lead to excess. Look no further than the "liberation" of Kabul by the normally rock-solid Simpson. And a recent piece-to-camera in which Marr walked off the screen to illustrate a point about Tony Blair was more Tomorrow's World than the 10 O'Clock News. There are dangers, too, from the growing practice of BBC correspondents going into print on their own behalf in magazines and the daily press. A recent Sunday Telegraph column by Jeff Randall indulged in such heavy Euro bashing that it compromised his position as a detached BBC observer. "Only the most partisan euro-warriors could argue that Britain needs the single currency", he said in part. This is unacceptable, just as it would be if Marr said "Vote New Labour" or Dickson advertised BUPA. Still, these are relatively small and rare excesses in the overall big picture. Better to make the occasional misjudgment than take no risks at all. It's certainly a price I'm prepared to pay as a viewer because when I now sit down before my TV set each evening, I feel that I am being better informed and better engaged than I ever was. Perhaps there is a Golden Age. This could be it.